Acer has announced the new Altos R880 F4 GPU server, which was launched at the GTC Taiwan 2018. 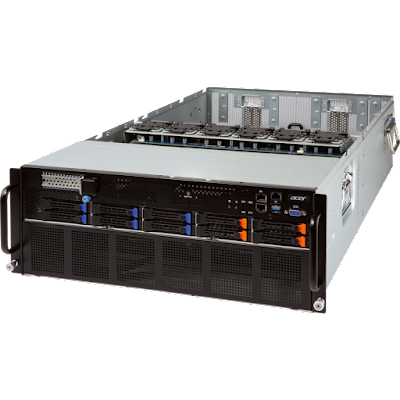 It can host up to eight NVIDIA Tesla V100 32GB SXM2 GPU accelerators, where every GPU pair includes one PCIe slot for high-speed interconnect. The Acer Altos R880 F4 is a member of the HGX-T1 class of NVIDIA GPU-Accelerated Server Platforms. It can significantly enhance performance by using parallel computing power for various applications, including oil and gas, defense, financial services, research, manufacturing, media and entertainment, 3D rendering, deep learning, and mission-critical applications. The Altos R880 and R480 F4 processors deliver exceptional workload-optimized performance and hardware-enhanced security. Designed for trusted data service delivery, the processors are fueled by significant leaps in I/O, memory, storage and network technologies. Acer will demonstrate both the R880 F4 and the R480 F4, as well as successful AI applications in deep learning at GTC Taiwan 2018.